A DIY Design blog written by designer Tiffany Gagnon, founder of The Corner Kingdom Project. Spray paint can change the way you shop! This is an underutilized product. Countless times I’ve been out shopping with friends/family who are decorating their homes, and they say “oh, this would have been perfect if only it were blue!”. They sigh, and move on in hopes of finding aqua-colored décor that will match their room perfectly. 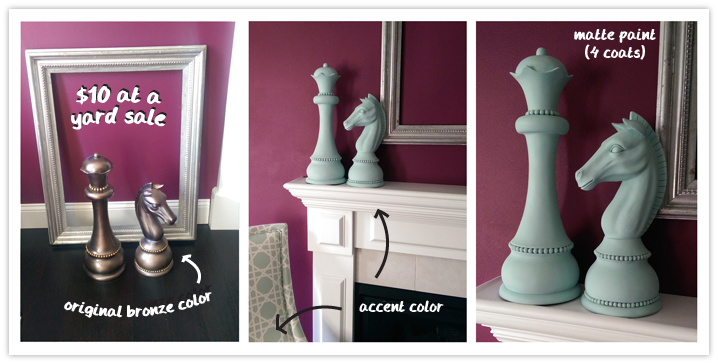 With a $4 can of spray paint, just about ANYTHING can be that perfect aqua accent color. You’ll have your pick of decorative accents when you know that just a little time and a few flicks of the wrist will change the room around you. What can you spray paint? Why should you utilize spray paint magic? Because color is powerful. Color is a powerful element. I’d argue that it is the most powerful element in our environments. It has the ability to affect our mood and set a tone. Because of this, people often notice color first. They notice color before they notice shape, size, smell, or texture. I believe this is why my friends and family pass by their “perfect find” at HomeGoods. They notice the color, acknowledge that it isn’t what they are actively searching for, and move on. You’ll start to notice shapes first. Walking into a store and knowing you can change the color of anything really opens your eyes. You start to notice shapes first. This same process happens when you walk around your home and look at what you can change/re-purpose/re-use/update. 1. Old things become new again. Great for tight budgets! Are you re-decorating on a budget? Even if you drastically change the style of a room, you don’t have to toss out everything in it. Knowing you can change that frame is a huge money-saver. Quick, easy, and I saved money by using what I already had. Example: Before buying our house, we had a quaint little apartment in a Boston suburb with original wood trim and built-ins. I decorated the dining room accordingly and played off of the natural charm of the space. Then, we bought a house that was newer construction and lacked the charm of our apartment. I decided to modernize the dining room design but didn’t want to find a new mirror. The new dining room was yellow, the old dining room was red and the mirror was black. I didn’t like the idea of bumblebee colors of yellow walls and black mirror. The solution? Spray paint! I painted that frame royal blue, which was the accent color of the room. 2. Yard sales. A thrifty decorator’s Christmas morning. Not everyone sees a Yard Sale sign and gets an instant rush of adrenalin. Some of you may cringe at the idea of buying someone else’s junk, but let me tell you that yard sales can offer treasures. And treasures can be spray painted to become unique and one-of-a-kind pieces in your home. Make it a perfect fit. Make it POP! I loved the idea of these surrealist chess pieces. Unfortunately they were bronze… and just wouldn’t match the room I planned to put them in. For those who are skeeved…Note: there’s also an added benefit for those who get skeeved-out by yard sale items. Just imagine the paint masking the “yuck and germs” with every coat. As I mentioned earlier, the magic of spray paint can really open your eyes and your possibilities. Walking around HomeGoods, Christmas Tree Shop, or your favorite store can be more fruitful when you know things don’t have to be the way they currently are… (there’s a deep, life lesson for you). The approach and brand of paint you choose depends on the surface of the object you’re painting. There are a few products out there claiming to chemically bond to plastic, making them scratch-proof. I’ve used Krylon Fusion, one such product, and have had good results. I’ve also used regular Rustoleum paint on rather shiny surfaces and have had good results as well. Essentially, almost any surface can be painted. Wood absorbs the best, plastics and resins can be painted very well with the right technique, as well as glass and metals. Read the label of the paint you are purchasing to make sure the surface you intend to paint is listed. Smoother surfaces: Smoother surfaces don’t allow for great bonding with paint, which can lead to chipping or scratching. Sand for a better base: To help create a better base surface for the paint to adhere to, rub a fine grain sand paper on the surface. Wipe off dust residue (make sure you really get it all off!) and then begin painting. If sandpaper isn’t an option, spray a very light coat from a little farther away than the recommended distance so that the fine paint droplets create a base texture for the next coat. Safety first, and breathing in paint fumes is not good for you. Use a high-quality mask to prevent any inhalation and always paint outside or in a well-ventilated area. Check the temperature specs on the can. Paint will not dry properly in the coldness of winter or the sweltering heat of summer. Wait for a day with an optimal temperature for best results. Protect surrounding surface by spreading newspaper or wrapping paper around the area. Tape it down to keep it from slipping. When painting on the grass, find a flat board or piece of cardboard to put down first. Place the newspaper over the cardboard. The uneven texture of the grass can cause the newspaper to bulge up and stick to your object. Also note, painting outside leaves you open to bugs and natural debris landing on the piece. Garages are really the best option. Know that you will use multiple coats. The first coat should NOT cover the entire item. It should be used as a thin base coat. Putting too much paint on the object at once will cause the paint to drip and prevent a smooth finish. Hold the can 12 inches from the object (or recommended distance on can directions) and cover small areas with one spray and arm movement. Cover only enough area that is showing while your object is lying down. Don’t try and move the object to get to the other side faster. Patience is KEY. Wait the recommended drying time. I completely understand your desire to get this painted as quickly as possible, but trust me, it’s worth the wait. Imperfections in the finish happen when you rush. A nice smooth, flawless coat will come from proper drying and re-applying time. Like wall color, the light and dark rules apply. When changing the color from dark to light, you will require more coats. And a coat of white primer will give you a richer color. Changing the color from light to dark will take fewer coats and you will get a richer color. Matte finishes are a little more forgiving, especially in darker colors. The shine of the gloss reflects light on details, including scratches or chips that happened during the painting process (because you may or may not have been impatient). When done flawlessly, gloss gives a more natural look to object whereas a matte looks more “pop art”, especially in lighter colors. Why not use regular paint? When done properly, spray paint allows for a smooth finish. This often makes it look like the object was originally made that way. Using regular acrylic paint and a brush gives the surface a texture. If you prefer a textured finish (and those are available in spray paints as well) hand painting may be your best option. However, it will take more time. This crate was originally gray, I used two regular acrylic paints to hand brush it. Notice the texture from the brush strokes. Courser brushes will show more texture than finer-bristled brushes. Everything in life is a trade-off. You have purchased an item from a yard sale, and therefore have re-purposed and recycled. You have also saved gas fumes by not going to the store to buy a new mirror. I try and live an environmentally conscious life, so I balance the affect of the paint with something to offset it. I’ll plant some flowers, or work from home for a day to decrease my carbon footprint. I suggest you do the same. Now you’ve learned how to be a wizard. Wield your spray can wand and make magic happen. It’s amazing how little changes can make such a big difference. Did this post help or inspire you? Say thanks by supporting our awesome cause!